In a pot, add in 1 tablespoon of cornstarch. Pour in 1 tablespoon of water into the pot. Add in ½ tablespoon of sesame oil. Sprinkle in ½ cup of brown sugar. Add in ½ cup of soy sauce. Pour in ¼ cup of apple cider vinegar. Mix in 2 cloves of garlic, and add pepper to taste. Whisk together all of the ingredients, and heat them over medium-low heat on the stovetop. Stir continuously, and continue cooking until the sauce has begun to thicken. Remove the sauce from the burner. Baste both sides of the chicken thighs with the teriyaki sauce mixture, and place them top side facing down on a baking rack. 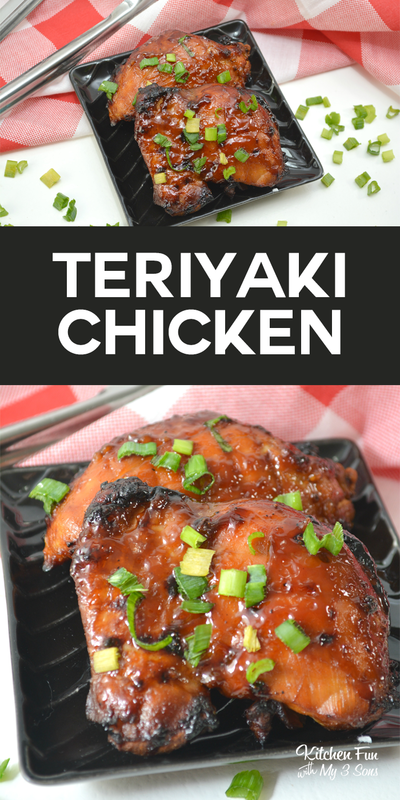 Bake for 15 minutes, baste with more teriyaki sauce, and bake for 15 minutes more. Flip the chicken thighs over, and baste with teriyaki sauce again. Bake for an additional 10 minutes, and then baste one last time. Return the chicken to the oven for a final 5 minutes of baking time.